Lease Offer. $4,869 due at signing includes $3,999 down, $0 security deposit, $650 acquisition fee and first month's payment of $220, excludes additional options, taxes, title and fees. Lease Offer. $4,924 due at signing includes $3,999 down, $0 security deposit, $650 acquisition fee and first month's payment of $275, excludes additional options, taxes, title and fees. Lease Offer. $4,964 due at signing includes $3,999 down, $0 security deposit, $650 acquisition fee and first month's payment of $315, excludes additional options, taxes, title and fees. Three distinct drive modes let you tailor RAV4's driving dynamics to match your mood. Sport Mode provides sharper acceleration, ECO Mode helps maximize fuel efficiency and Normal Mode blends fuel economy with performance. Enjoy a smooth ride that delivers driving confidence. RAV4's multi-link rear suspension improves handling and control by working with its natural body rigidity in order to keep traction steady. Available Dynamic Torque Vectoring All-Wheel Drive (TV-AWD) improves responsiveness and stability by sending up to 50 percent of the power to the rear and then further distributing more power to the wheel that needs it. To boost fuel efficiency, Rear Driveline Disconnect will stop sending power to the rear when it isn't necessary. 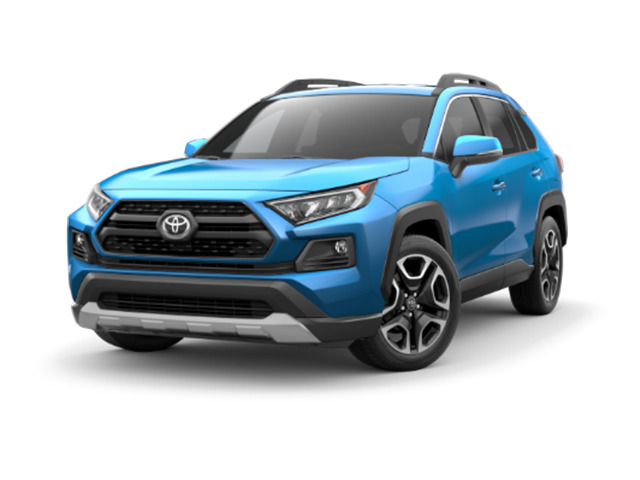 Inspired by Toyota's off-road heritage, Adventure grade's distinctive, rugged exterior features an aggressive grille, larger overfenders, unique Adventure roof rails and 19-inch five-spoke alloy wheels. This tough look also echoes Toyota's off-road past with an available Ice Edge-colored roof. Inside, orange accents are found throughout the interior and add the right amount of contrast to its sporty style. Good-looking from the ground up. RAV4's wheels are designed to complement every model's personality and style. From XLE's 17-inch five-spoke silver alloy wheels to Limited's available 19-inch multi-spoke super chrome-finished alloy wheels, you'll look good wherever your trips take you. Complementing Adventure grade's rugged exterior are seats that feature a unique pattern with orange accents. 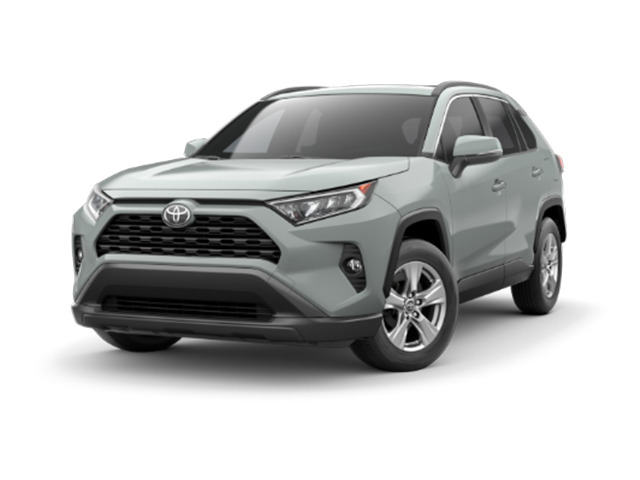 Available only to qualified customers through Toyota Financial through 4/30/2019. MSRP of $27,550. 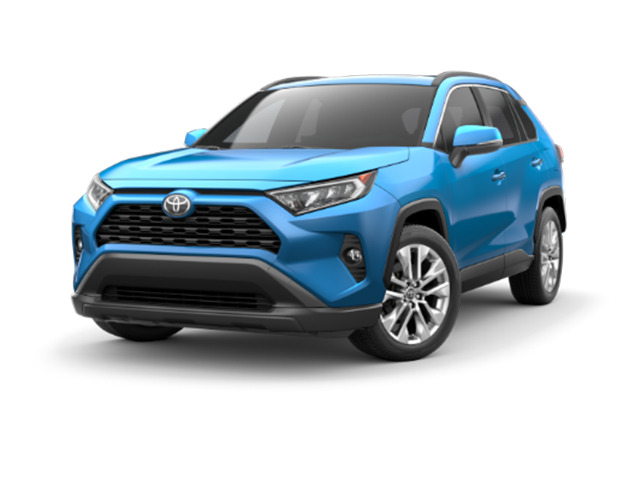 $4,869 due at signing includes $3,999 down, $0 security deposit, $650 acquisition fee and first month's payment of $220, excludes retailer fees, additional options, taxes, title and registration fees. Total monthly payments equal $7,920. Total payments equal $12,569. Actual rates and payments of closed-end lease may vary. Not everyone will qualify. You must take new retail delivery from dealer stock by 4/30/2019. Lessee responsible for insurance, maintenance, excess wear and excess mileage over 36,000 miles at $0.25 /mile. All amounts shown are estimates, retailer sets actual amounts. Includes all applicable offers. Residency restrictions apply. Lessee has option to purchase vehicle at lease end at price negotiated with retailer and approved lender at signing. Termination fee may apply. Contact dealer for availability and for complete details. MSRP of $31,336. $4,924 due at signing includes $3,999 down, $0 security deposit, $650 acquisition fee and first month's payment of $275, excludes retailer fees, additional options, taxes, title and registration fees. Total monthly payments equal $9,900. Total payments equal $14,549. Actual rates and payments of closed-end lease may vary. Not everyone will qualify. You must take new retail delivery from dealer stock by 4/30/2019. Lessee responsible for insurance, maintenance, excess wear and excess mileage over 30,000 miles at $0.25 /mile. All amounts shown are estimates, retailer sets actual amounts. Includes all applicable offers. Residency restrictions apply. Lessee has option to purchase vehicle at lease end at price negotiated with retailer and approved lender at signing. Termination fee may apply. Contact dealer for availability and for complete details. MSRP of $33,131. $4,964 due at signing includes $3,999 down, $0 security deposit, $650 acquisition fee and first month's payment of $315, excludes retailer fees, additional options, taxes, title and registration fees. Total monthly payments equal $11,340. Total payments equal $15,989. Actual rates and payments of closed-end lease may vary. Not everyone will qualify. You must take new retail delivery from dealer stock by 4/30/2019. Lessee responsible for insurance, maintenance, excess wear and excess mileage over 36,000 miles at $0.25 /mile. All amounts shown are estimates, retailer sets actual amounts. Includes all applicable offers. Residency restrictions apply. Lessee has option to purchase vehicle at lease end at price negotiated with retailer and approved lender at signing. Termination fee may apply. Contact dealer for availability and for complete details.